(12 Plants Classic Pint) Lantana x New Gold Lantana has a Dramatic mounding Habit and an Impressive Display of Golden Yellow Blooms from Late Spring Thru Fall. 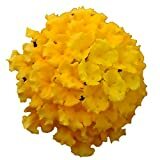 Lantana new gold for sale – Easy plant to grow, Lantana grown for the ornamental flowers and hedge plant, planting in early spring to summer, better to buy plant or another option to start from seeds. Blooming in the spring to the autumn and less in the winter, in star shaped flowers that appear in yellow color.